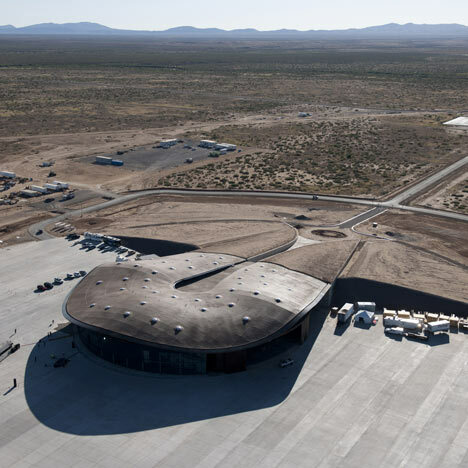 Foster + Partners have completed the world’s first space terminal for tourists in New Mexico. Flying displays by Virgin Galactic space vehicles WhiteKnightTwo and SpaceShipTwo marked the opening of Spaceport America. The low-rise building is dug into the landscape beside the El Camino Real road and is entered through a cleft between the two wings. Full-height glazing wraps around the end of the building, facing onto the runway beyond. The spaceport hangar is located in the centre of the building, with administrative areas to the west and flight training and preparation areas to the east. The project was designed in collaboration with New Mexico architects SMPC and project manager URS Corporation. Operators Virgin Galactic are currently running a test flight programme. Dezeen originally published visuals of the spaceport back in 2007 - see our earlier story here and see more stories about Virgin Galactic here. For more about Foster + Partners, including their circular campus proposals for Apple, click here. Photography is by Nigel Young, apart from where otherwise stated. A dedication ceremony was held at Spaceport America in New Mexico – the world’s first commercial space terminal. More than 800 guests attended the event, which included flying displays of Virgin Galactic’s WhiteKnightTwo and SpaceShipTwo vehicles. The Gateway will also house all astronaut preparation and celebration facilities, a mission control centre and a friends and family area. Entrance is via a deep channel cut into the landscape and its retaining walls form an exhibition space that documents a history of space exploration alongside the story of the region. With minimal embodied carbon and few additional energy requirements, the scheme has been designed to achieve LEED Gold accreditation. The low-lying form is dug into the landscape to exploit the thermal mass, which buffers the building from the extremes of the New Mexico climate as well as catching the westerly winds for ventilation; and maximum use is made of daylight via skylights. Built using local materials and construction techniques, it aims to be both sustainable and sensitive to its surroundings.